Gee, that’s too bad. It’s the “Madame Bovary” comparison that drives me a bit crazy, although for different reasons. The three novels do have one thing in common, in defense of Mr. Rockhead. But of course “Effi Briest” is the thing it is and not the thing it is not. Whoever promised you “power” is the rockhead. It ain’t that kind of book. I hope it wasn’t me. Having said that, Effi is a genuinely beloved character in Germany. The imaginative act of discovering why is worth the effort. It wasn’t you, my friend, you’ve never led me to false illusions about literature. How easy it would be to lump Madame Bovary, Anna Karenina, The Awakening, and Effi Briest together because of the foolishness of the female heart. (Or, the deception on the part of the male’s?) But, I think the reviewers who do that do them a great disservice, for they are about so much more than infidelity and its consequences. To me. And, of course, Anna Karenina is so beloved by me I would put that novel in no other category than a profound work of its own. That said, Effi annoyed me. To get sick and die by sitting too close to the evening air and its draughts is the perfect ending for such a milque-toast character. We never saw her fully engage (emotionally) with the Major, nor did we see any real closeness between her and her daughter. She didn’t appreciate the strength or love of her husband, and always seemed to be running away from growing up. It was only when she was with Roswitha that she became interesting to me. So why is she so beloved in Germany? Because she admitted her fault and humbled herself to her punishment? That was noble. But, the whole book seemed melodramatic to me, and thus not terribly effective. I think Fontane is no where near the writer I consider Tolstoy to be; his prose leaves me cold and most of his characters bored me. Oh no, Fontane is not nearly as big a writer as Tolstoy, nor Effi Briest as significant, or good, as Anna Karenina. Surely that is not what Mr. Rockhead meant? I am mostly here to defend poor Mr. Rockhead, who I feel you have maligned. To do literary history, we have put books and writers in categories! Even Tolstoy. I think you have identified German readers who distantly respect Effi, but not those who love her, who likely do not want her to grow up, not so fast at least, not yet, and are perhaps more like Samuel Beckett, for whom Effi Briest was one of his all-time favorite novels. The exchange with his Polish translator that I once excerpted is something else. “Scalded the eyes out of me reading Effie again, a page a day, with tears again”! Me? Malign someone? I’m just saying that I disagree with the thought of putting this book in the same category as Anna Karenina. As for tears in the eyes…perhaps they weren’t from sorrow as much as sleepiness. No, not everyone is struck by the same book in the same way, and of course each reader is entitled to his or her opinion. For me, this just did not carry enough weight to merit the praise that I’ve read in reference to it. Did you like it? I’m asking that seriously, as I respect your opinion. And, after perusing your post I can clearly see a similarity between Mann and Fontane. Good Lord, I am not a fan of German authors as of yet. Give me a Russian any day! “Rocks in the head” sounded pretty strongly negative to me! Maybe in grade-school world it is just jolly banter. Yes, I like the novel quite a bit, for all of its lively Flaubertish touches, which, as you know from my posts on Fontane were his innovation in German literature. The debate over dueling, and the events before and after, is also terrific, the ethical argument of the novel stated perhaps too openly. For some reason, whenever I wrote about a Fontane text I was tempted to write about him more generally, too, so that even though I never write about Effi Briest at length, my Fontane posts should answer the “like” question pretty well. The thing I really admired about this, when I read it, was that Effi dies AFTER the men in her life. 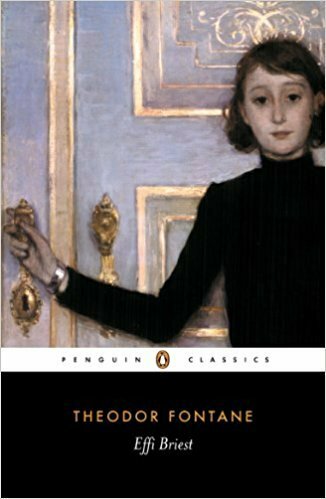 Her death isn’t a punishment for her wickedness, as it is for Anna Karenina and Emma Bovary; in that sense, it feels as though Fontane is much more modern and forward-looking than Tolstoy or Flaubert, which is really refreshing. Perhaps the comparison feels wrong precisely because of that stronger flavour of modernism that Fontane has. You make a good point about Effi dying after her lover, and Fontane being a more forward author. But, the comparison between Anna and Effi will never work for me (not that you are the one making it) because I find the power of the writing so much less significant from Fontane. He does not make me care about the people, or their issues, in the least. I found them underdeveloped, and sadly, boring. But, I appreciate your comment and thoughts very much. Fair enough! His style is so very different from Tolstoy’s that I could see how, if you were moved by the latter, you might not find Fontane’s approach engaging. Also, I am a little biased as Anna Karenina is one of my favorite books ever. Ever. Well, that’s bound to make anything else seem a bit pale by comparison! Hello. Mrs Rockhead on the line, as I have a tendency to impress this novel into anyone who asks me for a G-lit recommendation. Not sure I would promise power, or an Anna Karenina experience (thankfully, none of her histrionics in Fontane’s pages), but I would promise something more subtle, but equally devastating. The unnecessary crushing of a young girl/woman through Prussian convention – that was Fontane’s main focus, not the adultery. Blink and you’d miss the moment, but not the consequences, even if they don’t kick in until a decade later. I find Effi a far more sympathetic a character than Anna. The older I get, the more I also finding myself sympathising with Innstetten. I can’t condemn him the way my 18-year old self initially did. There’s more psychological subtlety (there’s that word again) in Fontane’s tale than I initially perceived. I now see Innstetten as much of a victim of Prussian conventions as Effi. Thank you, thank you, Lizzy, for shedding more light on the merit of this novel. I needed your comment, not that I will come to adore Effi Briest, but that I can find a better appreciation of it. A clue. A seasonal title beginning with W by a big name. Winter by Ali Smith? I loved Autumn! Great thread of comments; I enjoyed it. Can’t remember enough about the novel to comment, sadly. Perhaps this means it didn’t resonate with me so much, either. I don’t think you ‘maligned’ anyone, btw – it is a bit lazy to just lump a book with another because of some superficial resemblance of plot, character type, whatever. (Though I’m sure I’ve been guilty of it in my posts.) I’m sure I read somewhere that Fontane didn’t turn to novel writing until he was nearly 60…hope for us all. I’m still intrigued by how Anna Karenina and Effi Briest get categorized together. To me, there is very little to compare (which I’ll address further in Tom’s comment below), particularly when we look at the quality of writing. Tolstoy’s sentences take my breath. Yes! That is what I have been saying. This is why insults should be precise. Yes, Karenin and Instetten are both civil servants, “bureaucrats first and husbands second.” They are also both men. They can both be considered cold hearted, I think, or at least dispassionate. They seem to care more about the appearance of things from society’s point of view (and their superiors) than their wives and children. But, to me the books are different in ways far more significant than these two men. I am mostly concerned about Anna’s heart, which I saw developed much more fully than Effi’s. Also, I am wrapped up in the other characters Tolstoy has created, particularly Lenin and Oblonsky. They are almost as significant as Anna and Vronsky. Who does Fontane give us against which to weigh our values or life choices? Even Effi seems insubstantial to me, a little wisp of a girl who blows away with the wind (almost literally at the end of the novel). Yes! The books are also different. Who argued otherwise? If I understand your question, almost all of the characters play a role. The novel chronicles a series of terrible errors. Instetten should not have asked to marry Effi, the parents should have refused, Effi should have kicked and sccreamed. Instetten definitely should not have fought that duel. Yet all of these grievous mistakes were socially sanctioned. Everyone did what they were supposed to do. Everyone was wrong. The argument before the duel is the clearest statement, as Instetten and his friend, both knowing that the duel is nonsense, argue themselves into it. Lizzy’s right; the book is a direct attack on Prussian social conventions and the refusal to think through their consequences – that what Papa Briest’s famous last line is about. I’ll take it as a kick in the pants to Prussian social conventions, and nothing more. As for a novel in which I care deeply about the characters, I care very little for these, and social conventions are not something I’m terribly interested in. When were the masses ever right? I think a big part of why I read, or rather why a book matters deeply to me, is the extent to which I can connect to the characters. I believe I have mentioned this before, and you (Tom) have said that the characters are not terribly important to you (although you said it far more eloquently than that). But, they either live and breathe for me, or they don’t, and Fontane’s characters might as well have been filled with sawdust for as much as I cared about them. This is the main point, for me, which keeps the two novels (Anna and Effi) absolutely uncomparable. Once I was discussing disparate pedagogical methods with a colleague, and I said, “They are like apples and oranges.” He replied, “Meredith, they are like apples and cows.” Which is how I would lump Anna Karenina and Effi Briest; altogether not in the same category.